Successfully Added Doogee X6 Smartphone - 5.5 Inch HD IPS Screen, Android 5.1, Gesture Sensing, Smart Wake, Smart Motion, MTK6580, 2 SIM (Black) to your Shopping Cart. Looking for a large screen Smartphone that has stylish appearance and wont break the bank? Say hello to the Doogee X6. Its slim sensational design makes it aesthetically pleasing while its fantastic hardware really shines for its sub $100 price tag. With a large 5.5 inch screen you're getting a beautiful display that will show your movies and games in great HD resolutions and fantastic detail. With its IPS technology there you can enjoy wide viewing angles without the images appearing washed out ot distorted. Fantastic for sharing video clips with friends or playing games on the commute to work. This smart looking phone has a curved back and thin bezels so if fits comfortably in the hand. Its also exceptionally stylish with uniquely styled buttons on the side. It's not just the exterior o the phone that shines. 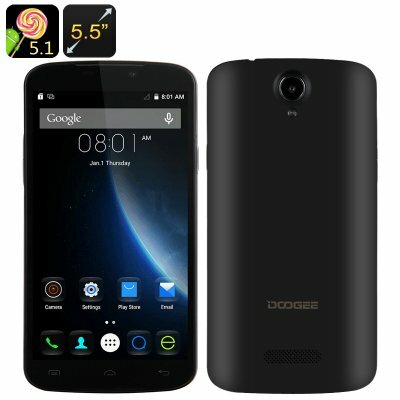 With a Quad core CPU and 1 GB of RAM the Doogee X6 is more than capable of meeting your daily cell phone demands. What's more there is a large 3000mAh battery so you can chat for up to 10 hours on a full change or have over 70 hours in standby. Android 5.1 is the familiar operating system with all that Google has to offer so you can optimize the layout, enjoy great customizations and even take advantage of voice commands. If that wasn't enough the Doogee X6 goes a step further and bring Smart Wake, Gesture Sensing Smart Motion. these three extras will take you interaction with the phone from the mundane to the incredible. A flip of the wrist can answer a call. Draw a letter on the screen to open you favorite app or scroll through the photo gallery without even touching your phone. This is sure to grab the attention of all those around you as you use Jedi like powers to interact with this impressive smartphone. Dual SIM slots make room for a micro and normal size cards and each offers both 2 and 3G network support over 7 frequencies so there's plenty of network compatibility. Organize and arrange you personal and business life with total ease as each SIM slot can be active at the same time.